There exists two different eras of the Tour de France in the American conscience—before Greg Lemond and after. Cycling’s most prestigious race barely registered on the domestic sports fan’s radar before Lemond rose to dominance, a kid from Reno who became the first American athlete to win it in 1986. With a heart rate of 38 beats per minute—Lemond was a freak athlete who didn’t possess an ounce of quit. That body would save him a year later when his brother-in-law accidentally shot him on a hunting trip. One of his lungs collapsed and three-quarters of his blood supply leaked out while waiting for rescue. Doctors left more than 30 shotgun pellets embedded in his body due to the danger associated with removing them. In 1989, he came back to overtake a massive lead built by Frenchman Laurent Fignon to win his second Tour de France by eight seconds. Later that year he won the World Championships to cement his place in sporting lore. 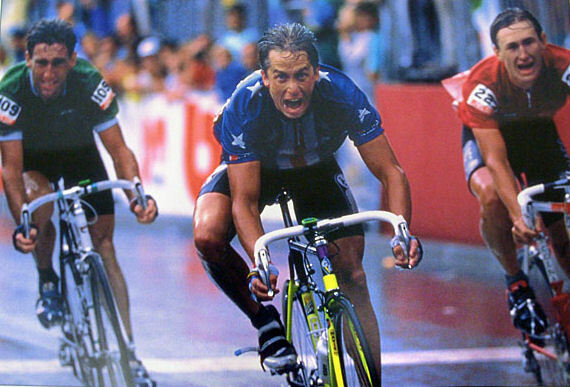 Lemond captured the yellow jersey by winning the Tour again in 1990. Lemond retired in the 1990s having won the Tour three times, collected three World Road Racing Championship trophies, earned recognition as ABC’s Wide World of Sports “Athlete of the Year” twice, Sportsman of the Year by Sports Illustrated once, and induction into the Cycling Hall of Fame. Good work for a former freestyle skier who took up cycling at the urging of a coach as a way to stay in shape in the offseason. Lemond is still revered the world over—everything from bikes to workout equipment is named in honor of the Wooster High School grad. He was our panel’s overwhelming choice as the region’s greatest ever athlete. Another Wooster High grad who took the sporting world by storm is golfer Patty Sheehan. She burst on to the pro scene in 1980, winning Rookie of the Year honors. Her storied career includes six majors and more than $5 million in winnings over a two-plus decade run on the LPGA tour. Sheehan split her college career between San Jose State and the University of Nevada Reno and earned Player of the Year recognition in the LPGA in 1983 and 1984 in addition to winning the Tour’s championship both seasons. She went on to win Sports Illustrated’s Sportsman of the Year honors in 1987. She’s a three-time hall of famer—UNR, the Collegiate Hall of Fame and the LPGA bestowed the honor—in addition to being a six-time major tournament winner. Her career low round—a 63—remains among the best of the women golfers of her generation, and she won her last LPGA event in 1996—16 years after her debut on the circuit. She was on the Top Ten money list of 12 straight seasons. Sheehan annually hosts the Patty Sheehan and Friends golf Tournament, which raises funds for Northern Nevada women’s and children’s charities, in addition to designing golf courses. Few American ski racers—men or women—can boast an amateur career comparable to Tamara McKinney’s. Born into a family of supernatural athletes, McKinney’s familiarity with skiing began early—hopping on the shoulders of big brother Steve as he ripped down the slopes of Mt. Rose. She went on to capture nine national titles, three World Cup discipline titles, and one overall World Cup title in 1983—the first American woman skier to win the honor. During the 1980s, McKinney won 18 World Cup races, finished another 24 in either second or third place and collected a gold and trio of bronzes at World Championships. Until the current U.S. ski sensation, Lindsey Vonn, bumped her into second place, McKinney was the winningest American skier in history. A practice run in 1989 resulted in a horrific leg break for the Squaw Valley resident, effectively ending her career in a year that had already seen her top the podium once. McKinney continues to make her home in Squaw, selling real estate and working part-time coaching the Squaw Valley Ski Team. A three-time Olympic medalist, Squaw Valley’s own Julia Mancuso is a star of alpine skiing both on and off the slopes. She’s shined at two Winter Olympics—Turin in 2006 and Vancouver in 2010—capturing Gold in giant slalom in ’06 and two Silvers, downhill and combined, at Vancouver. Since making her World Cup debut at age 15 in 1999, Mancuso has won seven World Cup races plus two silvers and two bronze medals at the World Championships. Last season, she was 2nd in Super G standings and 4th in Overall World Cup standings. Beyond her medals, Mancuso has garnered attention for her propensity to wear a tiara at competitions and her lingerie line. While she may have some more World Cup wins ahead, she’s also recently diversified, opening her own gym in Truckee. “Matt the Bat” Williams won four Gold Gloves at third base, and four Silver Slugger awards, was named to the Major League Baseball All Star team five times and slugged home runs in three different World Series for three different teams. A graduate of Carson High School, where he was known as the “Carson Crusher,” Williams attended the University of Nevada Las Vegas and caught the attention of the San Francisco Giants, who drafted him in 1986 brought the slugger up from the minors in 1987. In a career split between the Giants, Cleveland Indians and Arizona Diamondbacks, Williams appeared in three World Series (1989, 1997 and 2001), finished in the top four of MVP balloting four times and walloped a career 378 home runs in a 17 year career. His name still litters the record books at UNLV, where he was named an All-American in 1986. For ten consecutive years in the big leagues he hit at least 20 home runs and is one of just 11 players to “go yard” 300-plus times in the 1990s. Williams now serves as third base coach for the Diamondbacks. When Jonny Moseley nailed a 360 mute grab to capture Gold in moguls at the 1998 Nagano Winter Games, he instantly cementing his place as an Olympic legend. The Squaw Valley freestyle skier—born in Puerto Rico—dominated the games athletically and as a personality, earning endorsement deals and launching a career as a T.V. host with his megawatt smile. A resident of Tiburon, California, Moseley hadn’t seen snow until his family’s first trip to the Sierra Nevada in 1978. As the story goes, he instantly fell in love. By the early 90s he qualified for Squaw’s Freestyle team and begin spending most the ski season at Tahoe, barely missing a spot on the U.S. Olympic team in 1994. The first man to win both Olympic and X-Games medals, Moseley also notched 17 World Cup wins and twice was Overall World Cup Champion, 1995 and ‘96. He’s hosted or participated in a number of television shows, serves as Squaw’s official ambassador and is the new narrator for Warren Miller’s ski movies. Downhill ski racer, Daron Rahlves, became the first U.S. skier in a generation to win the prestigious Hahnenkamm Downhill race in Kitzbuhel, Austria, in 2003. Over his World Cup career, he won 12 races and shined at the World Championships, taking Gold in super G in 2001 and Silver and Bronze in 2005 in downhill and giant slalom, respectively. Upon retiring from World Cup alpine skiing in 2006, Rahlves took up skier cross and won X Games gold in 2008. After competing in the 2010 Olympics in skier cross, Rahlves retired from the top levels of competition but has stayed active in the local race scene, organizing the Rahlves Banzai Tour from his home mountain of Sugar Bowl, a tour that also includes stops at Squaw Valley, Alpine Meadows and Kirkwood mountains. In 1998—with Michael Jordan at the height of his powers and Tiger Woods ascending the world stage—USA Today put South Lake Tahoe’s Shaun Palmer on its front page and asked if he was “The World’s Greatest Athlete?” The South Lake native excelled at everything he tried, from snowboard halfpipe to ski cross, boardercross, motocross, auto racing and downhill mountain biking. While his first major victory was as a snowboarder, gold at the 1990 Half Pipe World Championship, from 1996-2008 Palmer medaled in world-class competition in five different sports all while operating as CEO of Palmer Snowboards—his own brand. He’s won 6 Winter X Games gold medals in three different sports. As a mountain biker, he won silver at the 1996 World Championships in downhill and gold at the 1999 Worlds in dual slalom. With such an unequaled record, there’s no doubt why Palmer personified the early extreme sports movement. A UNR football product, Frank Hawkins is considered a college football legend, ranking fourth all time in the NCAA in career rushing yards. In a pro career with the Los Angeles and later, Oakland Raiders, Hawkins appeared in one Super Bowl (1984) and was among the league leaders in rushing in 1983—not bad for a kid drafted in the 10th round coming out of Northern Nevada. During his time in Reno, Hawkins earned All American recognition three times and twice led the NCAA’s 1-AA division in rushing yards per season. Inducted into the College Football Hall of Fame in 1997, “The Hawk” trails only Texas’ Ricky Williams, Pittsburgh’s Tony Dorsett and USC’s Charles White in career rushing yards, with 5,333. Professionally Hawkins had a number of career highlights, including a game-winning touchdown against the heavily favored Washington Redskins at the conclusion of the 1983 season. Hawkins went on to become the first black man elected to the Las Vegas City Council and now serves as NAACP chairman in Las Vegas. An MLB All-Star as a pitcher during the height of the batters-on-steroids era, Douglas High School grad and Minden native Shawn Estes notched 1,210 strikeouts in a 13-year big league career. Among his career highlights were 101 wins and an All-Star selection in 1997 while playing for the San Francisco Giants. Estes was a two-way star on the mound and at the bat at Douglas, with the Seattle Mariners drafting him right out of high school in the first round in 1991. Estes bounced around the Mariners farm system before being traded to San Francisco in 1995, where he made a quick ascent to the majors. Estes earned his first big league victory in 1996 against the archrival LA Dodgers, before going 19-5 in 1997 in his best professional season. Estes earned notoriety in 2001 with the New York Mets, throwing behind opposing New York Yankees pitcher Roger Clemens when he came to bat in retaliation for Clemens’ throwing a bat at Mets catcher Mike Piazza during the previous year’s World Series. Later in the game, Estes socked a home run off Clemens, helping his cause in an 8-0 victory. Estes, honored on the Giants’ Wall of Fame, now co-hosts the team’s post game T.V. show. A two-time Olympic medalist, freestyle skier and Homewood native Shannon Bahrke excelled on the world stage despite an injury-riddled career. In 2003 she won the World Cup Freestyle title, in addition to earning a silver medal in the 2002 Salt Lake City Olympics and a bronze in Vancouver’s 2010 games. She now owns a Salt Lake City-based coffee roasting company called Silver Bean Coffee. Truckee’s Nate Holland is one of the most decorated snowboarders in U.S. history, winning five straight X Games snowboard cross Golds between 2006-2010, and again in 2012. Holland is a two-time Olympian and an exceptional slalom rider in addition to boarder cross. He continues to compete on the international circuit. The greatest quarterback to ever play for the UNR Wolf Pack, Colin Kaepernick started the fifth game of his freshman season and never relinquished the reigns. His name is a familiar sight in the UNR record books, and holds the distinction of being the only Division 1 quarterback to pass for more than 10,000 yards and rush for more than 4,000 yards in his career. Kaepernick now serves as backup quarterback for the San Francisco 49’ers. McKinney (older brother of Tamara) is a legend of speed skiing, the first man to surpass 200 kilometers-per-hour (124.3 mph) and founder of the first international speed skiers association. McKinney is primarily responsible for taking what was a one-event sport and creating a world-wide circuit of events. Speed skiing was an Olympic demonstration sport in 1992. Unfortunately, McKinney did not live to see the race due to his untimely death in a 1990 car accident when his stalled vehicle was hit by a drunk driver. From skier cross to big mountain skiing and BASE-jumping, Squaw Valley’s Shane McConkey excelled at everything he did. He competed in the X Games, was a U.S. Freeskiing National Champion and starred in a number of films before dying in a BASE-jumping accident in Italy in 2009. His pioneering use of fat skis and reverse-camber skis changed the way the world powder skis and he was posthumously inducted into the U.S. Ski and Snowboarding Hall of Fame in 2011. NFL Hall of Famer Marion Motley was one of the first players to break the league’s color barrier and did so forcefully, dominating the league throughout the 40s as a fullback averaging 5.7 yards per carry. The former UNR star is in the school’s Hall of Fame for terrorizing opponents between 1940-42. In 1995, the NFL recognized Motley as one of its 50 greatest players of all time. A sentimental favorite for our judges, from 1856-1876 John “Snowshoe” Thompson skied 100 lbs of mail per week 90 miles from Genoa, NV, to Placerville, CA, frequently through heavy snows. On wooden skis, Thompson pushed through the 2-3 day journey without blankets and frequently skied straight through the night. A legend among early skiers of the American West, Snowshoe was also an impressive ski-jumper. The U.S. Postal Service never paid him for his years of service. A Reno native, road cyclist Inga Thompson competed in three Olympics (1984, 1988, 1992) and won four national championships as a dominant Amercan cyclist. Twice—in 1987 and 1990—Thompson won Silver as as part of the US Team at the World Championship Team Trials. In 1991, she took second at the Worlds as an individual athlete. The youngest member of our notable athletes, Babbitt stormed through Nevada competition on the basketball court as a star for Galena High and later as a star on UNR’s hoops squad. The lanky scorer won first team all conference recognition during both of his seasons at UNR and went in the first round of the 2010 NBA draft. Babbitt is under contract with the Portland Trailblazers through the 2012-2013 season. Held back from his hometown Squaw Valley Olympics in 1960 due to his tender age of 16, ski racer Jimmie Heuga went on to win a bronze medal in slalom at 1964 Olympics in Innsbruck, Austria, becoming one of the first male U.S. skiers to medal in an Olympics. His career was cut short in 1968 due to the effects of multiple sclerosis, but he went on to advocate treatments for and research of the disease, creating the Jimmy Huega Center, before his death from complications associated with it. After a dominant run in the Nevada and national high school rodeo leagues in the mid-80s, Mendes went on to become a successful pro bull riding champion, winning the world title in 1997. Mendes, originally from Reno, qualified for the Nation Finals Rodeo five times throughout the 1990s in addition to winning seven rodeos outright. He now runs a Christian ministry bull riding camp in Texas. A former UNR defensive lineman, Charles Mann went on to win three Superbowls—two with the Washington Redskins and one with the San Francisco 49ers in 1994. He earned recognition as a college player by being voted the Big Sky Conference’s Most Valuable Defensive Lineman his senior year, and in the NFL he played in four Pro Bowls. Mann now assists in a number of nonprofits and charities in the Washington D.C. area. Known as the first man to climb The Nose of Yosemite’s El Capitan in a day, Bridwell is a former Tahoe resident and legend in climbing circles. He co-founded Yosemite’s Search and Rescue team and is credited with a number of difficult rescues. Bridwell continues to influence the climbing world as an author. A troubled youth made good, Ken Shamrock dominated the early years of the UFC mixed martial arts league before becoming a pro wrestler. ABC named the heavyweight, who fought out of Reno, “The World’s Most Dangerous Man,” given his success in the Octagon, which included multiple UFC championships and a 17-3 record in his first 20 fights. Shamrock now runs the Lion’s Den gym in Reno, where he trains fighters. Vladimir “Spider” Sabich grew up in Kyburz, CA, outside of South Lake Tahoe, and quickly rose to skiing prominence in 1968 with a World Cup slalom victory at Heavenly Valley and a fifth place in the Olympic slalom. Sabich went on to compete on the fledgling pro skiing circuit and won two titles there in the early 1970s. He was shot and killed by his girlfriend, Claudine Longet, in his Aspen, CO home in 1976. We asked voters to consider athletes for TQ’s Top 25 Athletes list who were either born or brought up in Tahoe/Reno, competed in the area (to encompass UNR athletes), or lived here while they were competing in their respective sports. Annika Sorenstam—A dominant female golfer during her career, the Swede is the only woman to break 60 in an official event. Sorenstam collected 89 victories in a Hall of Fame career. While her primary home is now in Florida, toward the end of her competitive career she spent much of the “off-season” at her former Incline residence and is now planning to purchase a new home in Incline. Franz Weber—The Austrian-born speed skier and Olympian downhill racer moved to the Reno/Tahoe area in 1984, just a year before retiring from World Cup racing. Weber still holds the North American speed skiing record at 129.303 mph, which he set in 1983 in Silverton, Colorado. Wayne Wong—A 20-plus year resident of Reno, Wong was the most prominent star among the first freestyle skiing competitors in the 1970s. The British Columbia native was the poster child for the new sport, featured in Pepsi commercials. Wong now favors carving skis and can be frequently found laying down tracks at Tahoe resorts in winter, particularly Mt. Rose. Julie Young—A former top-tier cycling champ and California native, Young won the Tour de L’Aude in 1992—the women’s equivalent of the Tour de France—and was a 12 year member of the US National Cycling Team. She now owns and operates a gym in Truckee and serves as a coach and competitor in local races, including the Big Blue Adventure series. Glenn Carano: A Reno native and former collegiate star at the University of Nevada, Las Vegas, Glenn earned a Super Bowl ring while backup quarterback for the Dallas Cowboys. He is now director of marketing at Silver Legacy Resort Casino in Reno and father of MMA fighter and film star Gina Carano. Mike Croke: Croke, a one-time Tahoe competitive freestyle skier and now an avid mountain biker, owns and operates the Village Ski Loft in Incline Village. Dan Hinxman: Hinxman is a longtime sports columnist, golf writer and college football recruiting writer for the Reno Gazette-Journal. Luther Mack, Jr.: Mack is a former Chairman of the Nevada State Athletic Commission and a Reno businessman. Dr. Terrance Orr: Orr is the head physician for the Men’s U.S. Alpine Ski Team and served on the medical staff at the 2002 and 2006 Winter Olympics. A South Lake Tahoe resident, Orr is an orthopedic surgeon at Barton Health. Franz Weber: Weber is a former Austrian Olympic speed skier who is currently a supporter of the effort to bring the Olympics back to Reno/Tahoe. He owns Franz Weber, Inc., a sports management consultant company based in Reno. Sylas Wright: Wright is a longtime Tahoe-Truckee sports editor. Tahoe Quarterly: Editorial staff contributed two votes.